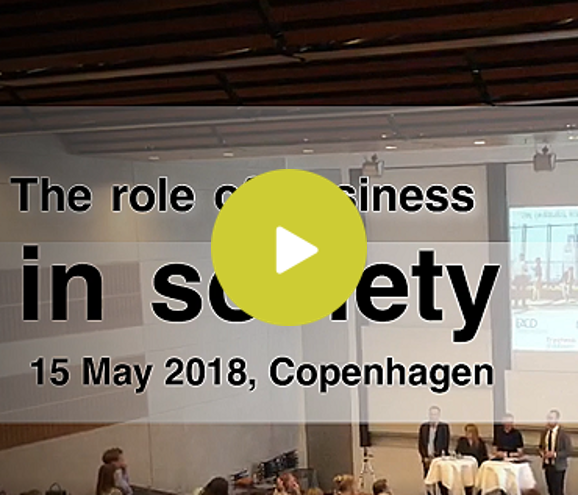 I had the pleasure of moderating a regional EACD debate in Copenhagen on 15 May, which brought together corporate communicators, marketers, academics and CSR executives – and focused on the topic of the changing role of business in society. To clear things up right off the bat I posed this question at the very beginning – is it really just about CSR? I showed the recent SAP commercial as an indication that large companies are beginning to understand that the public today expects more from them: to solve societal problems not just as part of their social responsibility, but as part of the very definition of how they create value. Surely this means the role of business in society extends beyond what we know as CSR? The event’s host, Copenhagen Business School’s new Dean of Education Gregor Halff, then spoke about the issue that while business is often part of solving big societal problems – it is many times part of creating them. He challenged the audience to think whether business schools today truly educate tomorrow’s leaders in a way that equips them to solving such problems in a future business landscape that’s changing so rapidly. He was followed by Michael Rasmussen, owner of [email protected] and formerly CMO for 17 years at Velux – the Danish roof windows and skylights manufacturer. Michael spoke about the importance of purpose driving business, as it’s not just expectations that are changing – it’s the consumers’ actual perception of value that is completely transforming. Ulrich Bang, VP at TryghedsGruppen (the owner of one of the largest Scandinavian insurance providers), then added an interesting perspective: as a co-operative owned by its policyholders, his company’s role is to “provide safety” in the wider sense – both by selling insurance policies but also by increasing the sense of safety for individuals and communities through its foundation, which is involved in a wide range of activities that aim to promote “peace of mind” among the population. Mirella Vitale, SVP for Group Marketing and Communications at Rockwool Group – the world’s second largest maker of insulation materials – rounded up by agreeing that a true purpose-driven company makes sure that the business it does is also good for the world, meaning that product innovation should not be driven by “what could sell more” but rather by “what could solve people’s – and society’s – problems”. She gave a great example of Rockwool’s new floor board product that absorbs water to prevent flooding in public areas – an important innovation in a world that experiences ever more floods. For some, any discussion of “business in society” is a discussion of CSR. But if industry leaders talk about the changing consumer perception of value and the need to drive product innovation by what’s good for society, and if leading business schools talk about how to equip future business leaders to solve future societal problems – then there’s no doubt in my mind that this topic goes far beyond the traditional CSR debate. I wish to thank Copenhagen Business School for hosting this important and engaging debate – and I look forward to having more such discussions in the near future!